Internet service provider Tiscali will launch Tiscali TV , a television service for its broadband subscribers, on 1 March. More than 30 digital channels will be available on Tiscali TV, as well as on-demand programming. Tiscali said it hopes that 10 million homes will be able to get the service by the end of this year, and its entire network by the end of 2008. Tiscali TV will be available to customers who subscribe to the company's 2Mbps broadband package. It will cost £15 per month. A triple-play package - including broadband access, 25 more digital TV channels, on-demand content and free line rental and weekend calls - will also be available, for £20 per month. As all the content is delivered via the telephone line, users won't need a TV aerial or satellite dish. 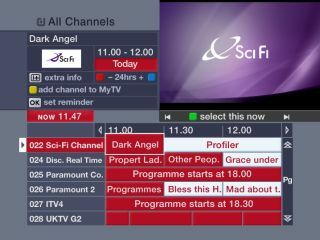 Mary Turner, chief executive at Tiscali UK, said: "Our TV service gives customers broadband plus the channel choice they want and free on-demand programming, all for the price you would pay for a standard broadband connection." Tiscali bought ISP Homechoice in August last year, and the 40,000 ex-Homechoice subscribers will be transferred to Tiscali on 1 March. Tiscali TV will initially only be available in London and Stevenage but, from May, Birmingham, Edinburgh and Newcastle will also get the service. Liverpool, Sheffield and Leeds will be covered by the summer. The company said it will also be launching a set-top box able to record high-definition content on a 160GB hard drive. The device will be launched in July.